I discovered, not a problem i would say but something to take notice off and maybe there is a possible fix? Came from a 7 hour long flight from OMDB - ENGM and was instructed by ATC to park at stand 50. 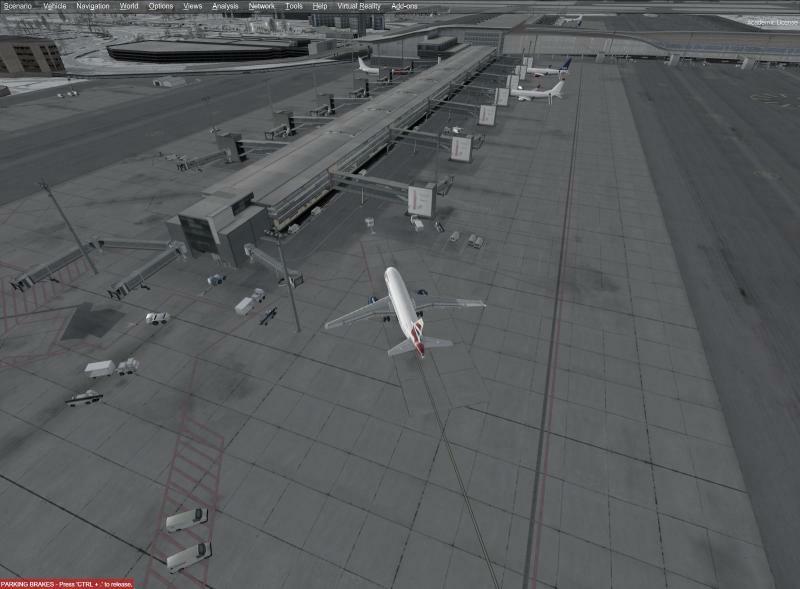 (The most common used gate for Emirates 77W at OSL) Once at the gate i felt something was wierd with the stand. I looked up the actual stand on Youtube and Google Maps and yes indeed i was right. First of all it feels like the jetway is placed too low on the main building since it has to travel upwards alot to reach the 777-300ER door. The stairs on the jetway is pretty much hanging and became more of a ladder. This has to be connected with the second issue i saw. The layout of the stands in this particular "corner" if you will, dosent look right at all. (see and compare the 2 pic) It seems that the angle the aircraft is coming in is off, and the gate has to travel TWICE the distance forward and up to reach the door. Also the light pole is way off position. Nearly all of these issues has to be connected to one common factor, that the acutal ground paint and layout is done wrong and in a wrong "angle". Yes iam aware of that im not on the actual taxi line, but this was just to show that no matter if i go closer, the stairs is gonna be hanging and the light pole is gonna hit the wing, and still the jetway has to travel far more than it should have. Yes i know this is just a sim and tbh the airport overall looks stunning. But hey, if you are now going to model something for later selling, why not do it correct? Developers please dont see this as an "issue" but more like a heads up for things that could be improved. Otherwise well done! I do apologise for my english grammar and structure. Hi, you are showing two different buildings. For me it looks that there are two buildings overlapping. Do you have another ENGM add-on still installed and active? Also take a look to the hotfix list. 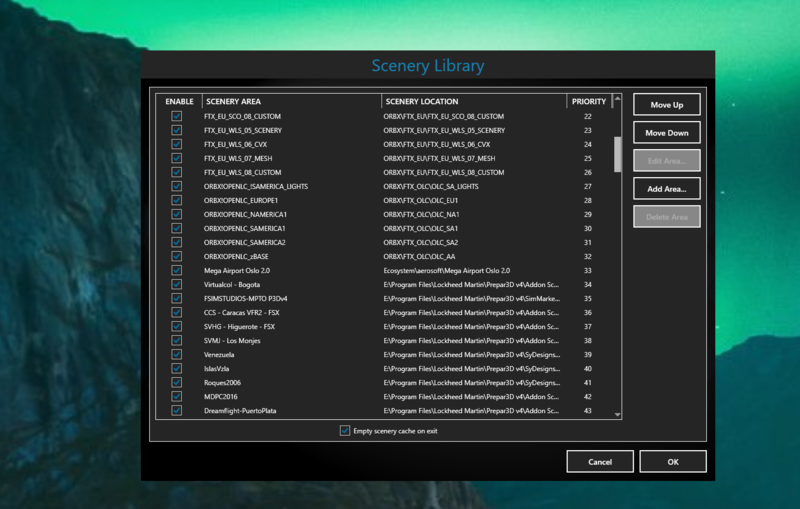 Make sure ENGM is above all Orbx entries in your scenery library. 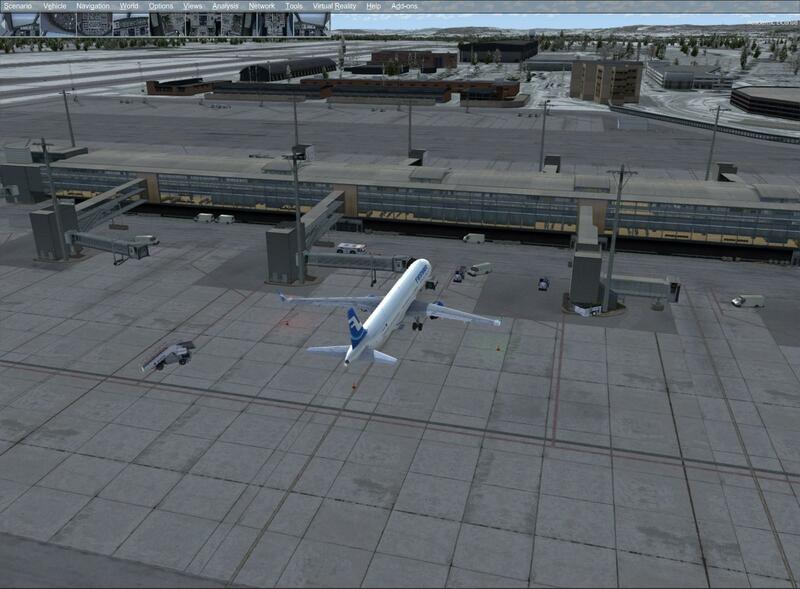 Negative, only mega airport oslo, but also FTX norway, but that dosent change the airport layout and especially not overlapping the aerosoft scenery? I have now tried with FTX norway disabled but ending up with the same results. Still the angle seems way off and the aircraft too far from the main building. Also the light pole cant be in the right position since its not only too close to the wing but also within the red marked "stand" area. Im afraid this is just how the scenery was made. 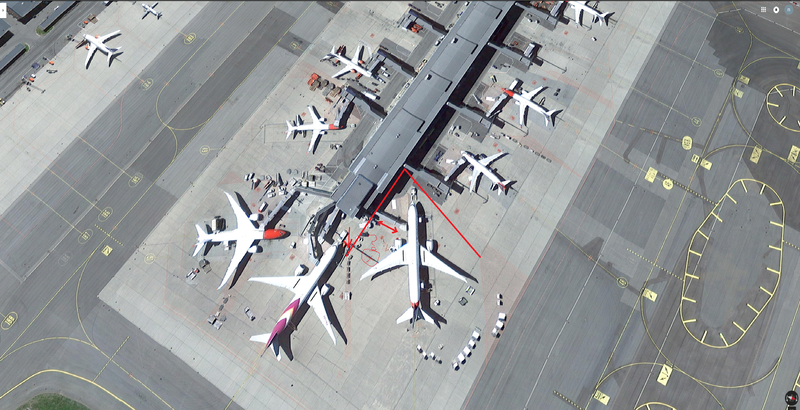 I tried lining up the aircraft so the gate when docked gets the same angle as satelite pictures. The airplane is way off left of the yellow taxiline, and i have a big lightpole in the middle of the left wing. Also since either the stairs are made too short or the gate entrance set too low on the building, the stairs to the gate/jetway is still "hanging" but its no big deal really. Couldnt someone else upload a picture to see how it looks on your sim? Hi @Jo Erlend, can you provide a fix for this issues at the end of the terminal, please?The lighpoles are not at the correct position and third is missing, according to google. The two existing need to be moved south. Can you also add the second jetway for the stand at the frontside of the terminal, please? 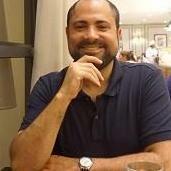 Hello and thank you very much for your upload! I compared your picture with my sim and it looks identical. I will try to post another picture here where I will stand with my point that the stand, taxilines, red lines, still are off angle and not correctly placed. I dont know how to explain it better but comparing the scenery with google earth satelite pictures, something is just "off". In your sim also since this is the way the scenery is made. Here is a pic where i tried to adjust the aircraft to satelite pictures as much as the eye can allow. I also looked at the angle of the gate when its docked to get a more exact position, but still its not perfect. This is what i ended up with, and if you look at the latest satelite pictures of the area you will see its quite accurate. The light poles are not correct, as Bob also mentioned and we will see if/when the dev can provide a fix. Yes indeed the first photo was not ideal. It was just a fast paint edit to show the difference betweeen sim and satelite pictures, and there must have been some issue when copying over to paint making the building look wierd. Why the aircraft is positioned left of the centerline i already explained in the text above. I disagree with you regarding the paint layout and position. Compared to satelite pictures its off and too far from the terminal building. Now you cant tell me with a straight face that looks aligned and identical. Sure its very hard to compare it this way but the red lines marking the stand and gate move area are not the same and they are drawn way closer to the terminal building in real life, and coming in at a different angle. Here's a hotfix for the flood light placement, I've included fixes for some other issues as well. - Corrected flood light placement on eastern part of the terminal. - Adjusted dynamic light effect to prevent it from spawning more than once when returning to the airport. Extract the zip file and replace the old files with the new ones included. New download links posted bellow. At the moment there's no plans to redo the ground marking, it hasn't been remodeled since the original release of the scenery in 2013 so there's some differences now compared to how it was back then. Awesome, thank you for amazing and fast support! Hi, here's an updated hotfix for oslo. See changelog bellow. 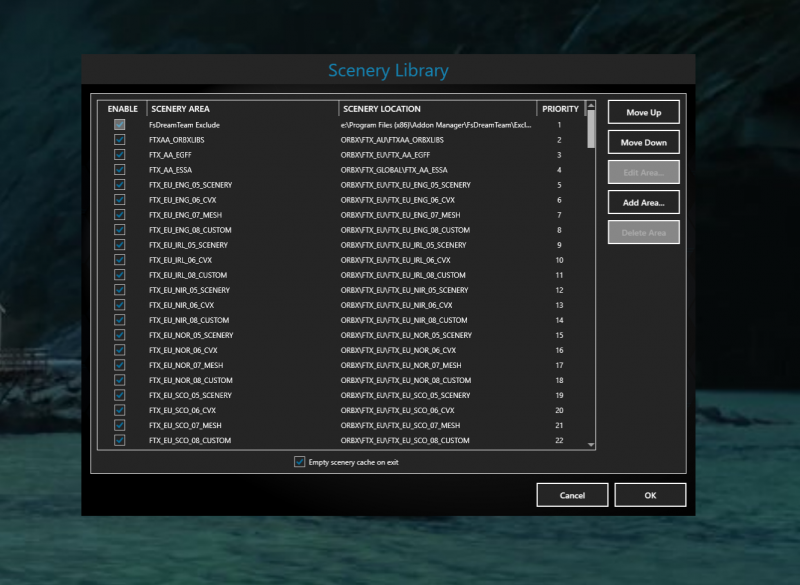 - Fixed double ILS localizer 3D models in P3Dv4. 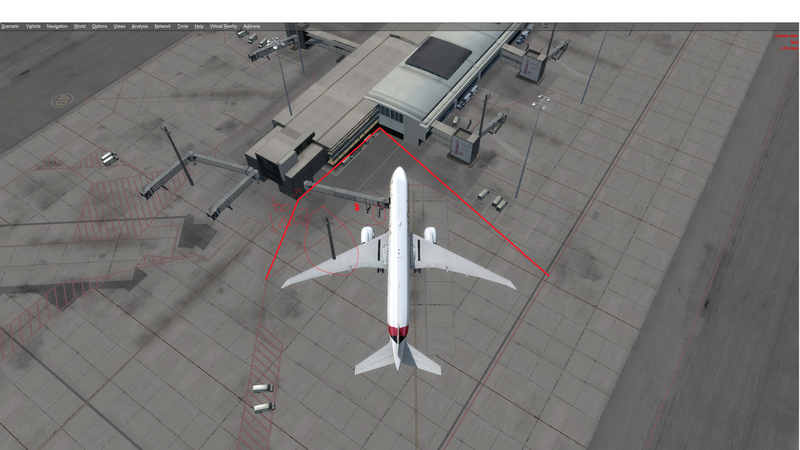 - Fixed incorrect object placement when running the config tool after the jetway tool, resulting in double jetway models. - Adjusted dynamic light effect (P3Dv4) to be more performance friendly. Hi. The gates gets in to a weird positon when I use GSX.. What is the problem..? How about posting a picture to show us what you mean? Wondering if outside of the HOT FIX Zip (with its copy paste to replace files) any other action is required. 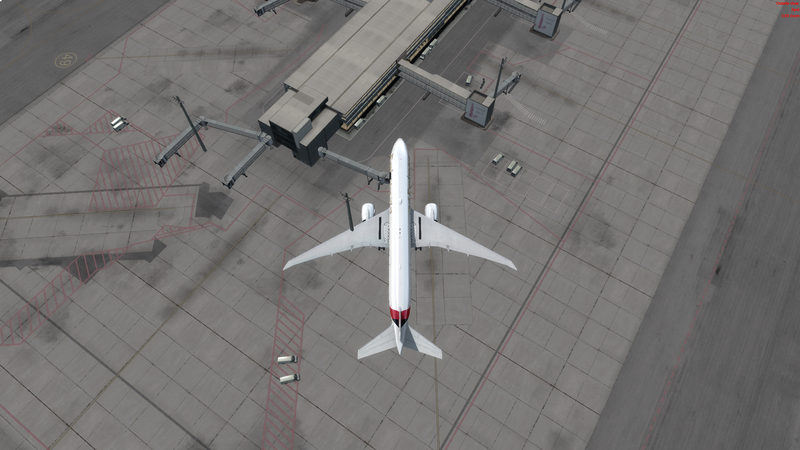 I'm showing duality of taxi signs in some areas like holding points, afcad and scenery mismatch, a double ILS signal which cause a GPWS on the ILS for RWY01R plus double building in the EAST wing of the terminal with its accompanying items, like light poles. Please post a screenshot of your scenery library so that we can see where ENGM sits. Here we have the scenery list. Hope this helps. ALL Orbx entries have to be below your last 3rd party addon. You can manage this by setting the library insertion point in the FTXCentral settings correctly. Choose the 3rd party addon being at the lowest position. More information on this can be found in the FTXCentral manual.